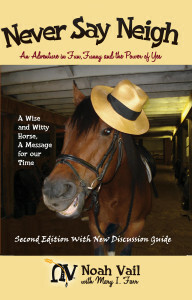 Meet Noah Vail, author, humorist … and horse. 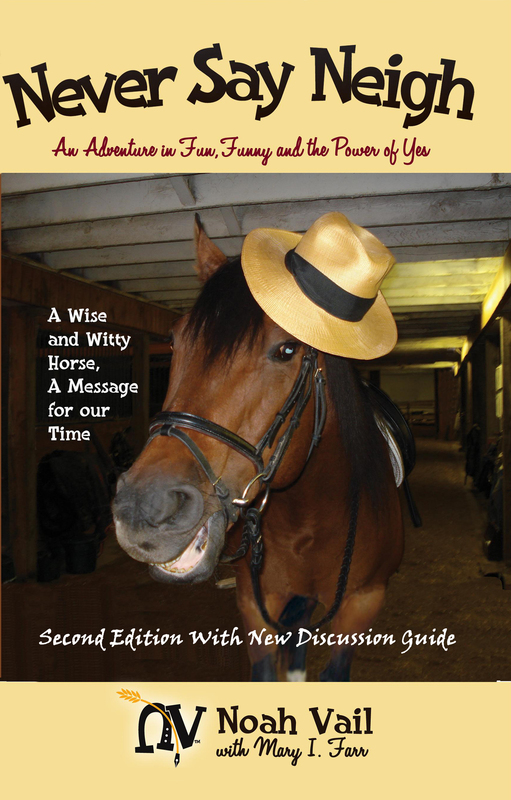 In Never Say Neigh, Noah shares his wise and timely insights (with a little help from Mary Farr) with the humor and panache that only a clever horse can provide. It all started with a radio, a black plastic squawker that sits on a shelf outside Noah’s room. Now don’t get him wrong. He enjoys a Saint Paul Saints baseball game, or the smooth sounds of a little Nora Jones, but the daily flood of cheerless talk radio gives him migraines. Shrill voices filling the airways with reckless claims make him sweat. While he does not speak lightly about grave issues, Noah feels it’s high time for more fun and funny–a humorous corrective, so to speak. This Noah operates in a world of horse hilarity. He writes. He travels. He plays cribbage. He falls in love. He dishes on the human condition. He even sounds off on things like hope, trust and the meaning of Valentine’s Day. Noah’s a good news kind of guy who operates on the 100-watt side of life. The only thing funnier than his laugh out loud exploits is the fact that the exploits say more about the rest of us than they do about a horse named Noah Vail. If you live in NYC, you might see HumorOutcasts’s Mary Farr, or rather her fine horse Noah Vail, author of Never Say Neigh, featured on some public transportation for the Equus Film Festival happening on Nov. 21-22 . TheEquus Film Festival NYC highlights and awards the diverse and creative efforts of those in indie film, music, and advertising, who artistically pay homage to the horse. The Equus Film Festival is the first indie film festival orientated around equestrian themed content from around the world. The films and commercial content show the rich history and diverse tapestry of the horse in human culture, film, the arts, and advertising.